Tremendous diversity exists among trees commonly referred to as plums--from those that produce nicely sized fruits to those that are best admired as ornamental trees with prolific spring flowering displays or handsomely colored foliage. All plum species need some exposure to winter cold to reliably produce flowers the following spring, a process called vernalization. Plums need insect pollinators like honeybees to facilitate good fruit set. Generally three types of plum trees are grown for their tasty fruits: European plum (Prunus domestica), Japanese plum (Prunus salicina) and numerous native American plum species. Plums hybridize with each other rather easily, allowing horticulturists to cross species to develop plum trees with more cold hardiness, better sized or tasting fruits or more resilient to diseases. Many native American plums are cross-bred with Japanese plums to improve their ability to withstand brutally cold winters in regions such as the American Upper Midwest or the prairie provinces of Canada, according to the "Sunset National Garden Book." In fact, there are more than 600 plum varieties derived from American plums, according to "Economic Botany: Plants in Our World," by Beryl Simpson and Molly Ogorzaly. Plum tree flowers resemble those of cherries, peaches and apricots, to which they are closely related as members of the rose family. 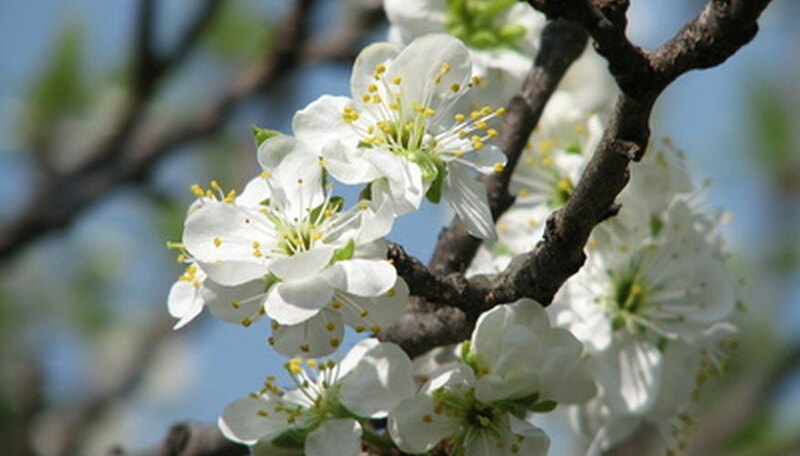 Plum blossoms are usually white, rarely pink and have five petals. Flowering occurs in early spring before new leaves emerge. 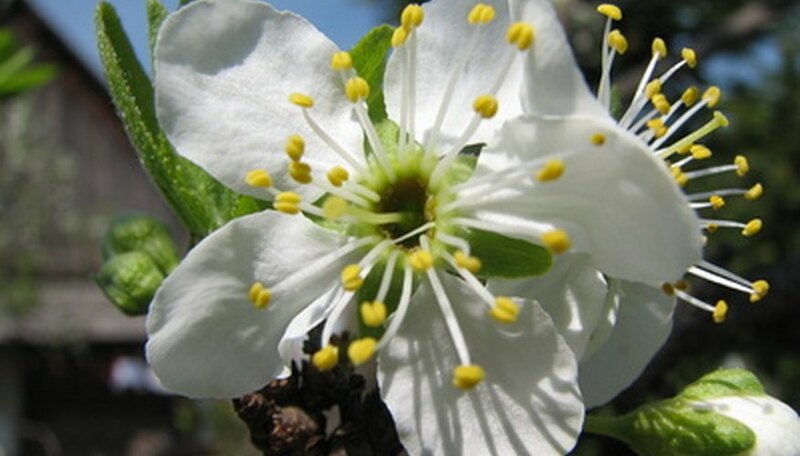 Japanese and American native plum species tend to bloom earlier in spring than European plums. In regions where untimely spring frosts occur, European plums are favored by gardeners, because their later blooming prevents flower kill from tardy cold weather. 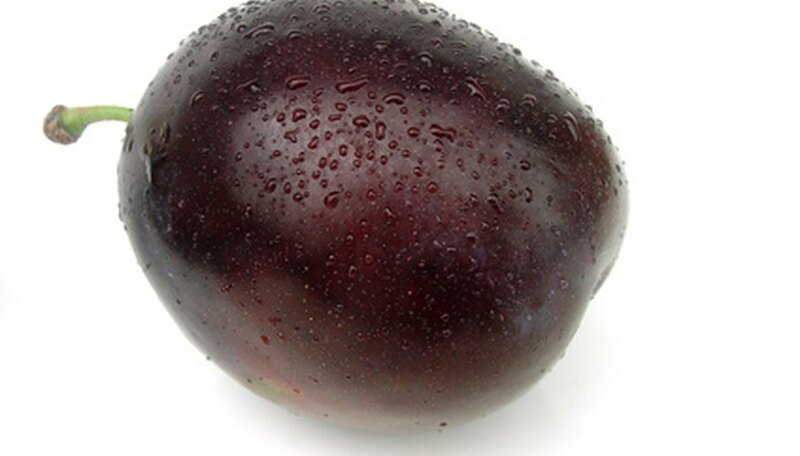 Plum fruits' skin colors range from yellow and red to purple, green, blue and nearly black. The fruit's flesh is usually red, yellow or green. Japanese plum trees develop the largest and juiciest fruits and are acidy but sweet. 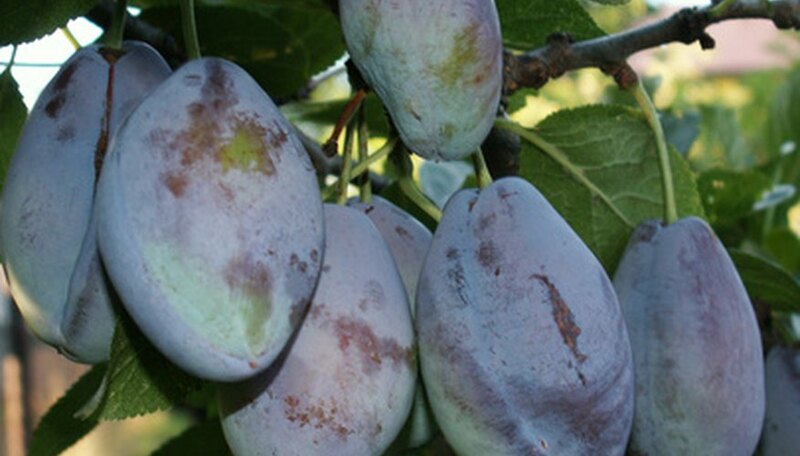 European plum trees' fruits have firmer flesh and are much sweeter; prunes are made from European plums. American plums, in general comparison, are smallest and have very watery flesh, making them best used in preserves or pastries, although some are nice when eaten fresh. Ornamental flowering plums (such as Prunus cerasifera) rarely develop fruits, or if they do, the fruits are very small and taste bad. They may be made into preserves, though. Japanese plum trees develop into smaller-sized, vase-shaped trees when compared with European plum trees. Japanese types also produce more springtime flowers and subsequent fruits. The heavy production of fruits on Japanese plum trees calls for removal of young fruits to a spacing of 4 to 6 inches to prevent branch breakage later in summer. European plum trees don't set nearly the same amount of flowers, and fruits grow on their more upright and larger and taller branches. Plum trees are grown in all states except Alaska, according to "Economic Botany: Plants in Our World." Commercial Japanese plum tree orchards are widely found in California's Central Valley but are also grown in gardens across the South and the West. European plums are grown more in the Northeast and north-central states, although California, Oregon, Idaho and Washington make up the greatest commercial European plum orchards. Michigan also grows many of these trees. California produces 95 to 98 percent of all plums in the United States, according to the University of Georgia.